This long-awaited smart outdoor watch with Android Wear 2.0 can be finally purchased directly from Casio's website or via Amazon. It has a price tag of $500 USD and comes in black and orange. Casio is well-known for its timepieces, but this iconic Japanese brand only has a few smart wearables on the market. Not long after launching the WSD-F10, Casio unveiled the WSD-F20 smart outdoor watch with low-power GPS and offline color map functionality that can be used "to expand the range of outdoor adventures." 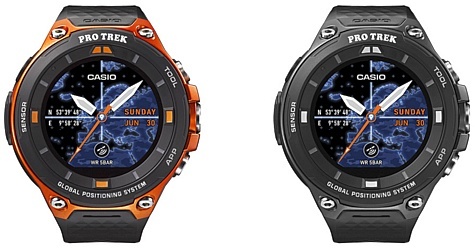 Those who forgot the highlights of this Android Wear 2.0-driven smart wearable should keep in mind that the Casio Pro Trek WSD-F20 targets those who need reliability and increased autonomy for long periods spent outdoors. Its specs include MIL-STD-810 compliance, 50-meter water resistance, expanded iOS functionality, one to two days of normal use and up to a month of autonomy in timekeeping mode. Casio Pro Trek WSD-F20 requires a compatible device with Android 4.3 or later or an iPhone 5 or later running iOS 9.0 or later. The color options available are orange and black. The price remains the same as that of its predecessor - $500 USD. Those interested can acquire it from Amazon or directly from Casio's online store.